Yorkshire head coach Jason Gillespie believes England should continue to pick Joe Root as an opening batsman. Experienced Australia opener Chris Rogers has said his Middlesex team-mate Sam Robson is more suited to the role than the Yorkshireman. 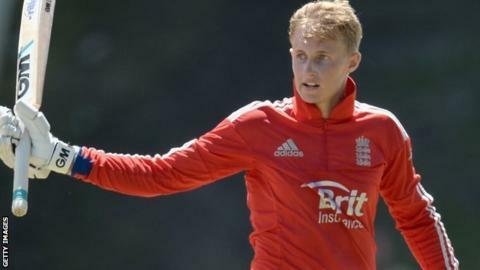 Root, 23, was dropped from the England Test side after struggling during the winter's 5-0 Ashes whitewash. But Gillespie told BBC Radio Leeds: "I respectfully disagree with Chris, Joe Root is a fantastic opening batsman." Root is currently recovering from the fractured thumb that saw him miss the ICC World Twenty20, but is expected to return in Yorkshire's County Championship match against Middlesex which starts at Lord's on 27 April. Gillespie believes the fact Root has been asked to bat in a number of different positions for England may not have helped him settle. "Joe has performed very well in that opening role for both Yorkshire and England, but the beauty about him is he's a very adaptable cricketer, he can pretty much bat anywhere and has done that in his Test career so far," said Gillespie. "In part he probably hasn't been as consistent as he would have liked but he has been moved around and batted in a number of positions, whereas other players have just been locked in to certain spots. "I think he can open, and be equally adaptable in the middle order. The point is he's a very important part of England's future and I'm looking forward to seeing him have a long and fruitful career for his country." Gillespie, who took 259 wickets for Australia in 71 Test appearances for his country, has also explained why he did not apply for the vacant England head coach's position. "It's incredibly flattering that people would put my name forward and suggest I would do a good job, and an international job at some point in the future is something that may appeal, but I feel I still have a lot to learn," he said. "I didn't apply, I wasn't asked to apply. It will be a fantastic opportunity for whoever is appointed. "I still have plenty to learn about both coaching and man-management, and I feel I'm in the right place at Yorkshire to get that education."